After who-knows-how-many printings of Illuminati, it's time to refresh the cards to fit the current New World Order. So in 2018, that will happen. In the process of reviewing the cards, well over half of them got renamed, revised, or totally replaced. And while I was doing that, I noticed a way in which the world is very different now. The Communist menace is less of a public bugaboo than it was a couple of decades ago. And, on the other side of the coin, government bodies now spend as much time suing each other as they do cooperating. Executive summary: I took out both the Communist and Government alignments. The new card set works fine without them. It still includes some governmental groups but they are no longer tagged as a specific alignment. However, the media has become steadily more powerful, while quarreling madly within itself and often becoming a target of other organizations. So Media is now an official alignment, which gives media groups a bonus to control each other. That seems only fair. We are seriously thinking about making the cards bigger in the new set: maybe tarot-sized, which is 70 x 120 mm. That will let us make both the type and the art bigger, but it will also take up more space on the table. Your feedback on this will be appreciated. And, of course, we want your feedback on the new card set. You can find an unillustrated but playable PDF on the Illuminati site; make your own cards and take over the world of 2018. After you take over the world a few times, tell me what you think! Best way to communicate is on the forums – the discussion is already rolling. 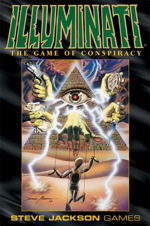 PS – I would be remiss if I failed to mention the Conspiracy Theory project, now in its last days on Kickstarter. If you're reading this, you probably already know all about it, but fnord.